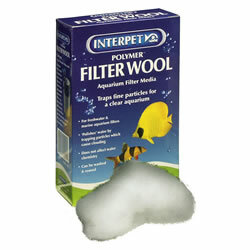 Interpet Filter Wool is an ideal aquarium filter media for trapping fine particles to ensure water clarity. Sold & dispatched by Pond Planet. The inert nature of the Polymer Filter Wool ensures the product does not effect the water chemistry but simply 'polishes' the water to reduce cloudiness. Interpet Filter Wool can be used in freshwater and marine aquarium filters and can be washed and re-used time and time again.